To renew a membership online follow the three easy steps below. 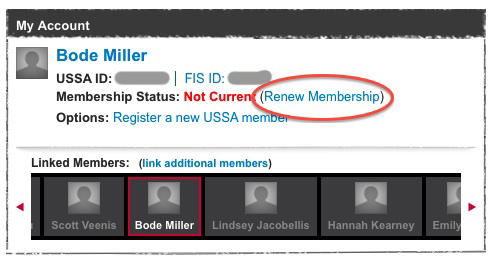 You can renew a membership for yourself or any member linked to your My USSA account. For information on linking members to your My USSA account see the FAQ "Linking Members to a My USSA account". If you have any questions regarding renewing a membership see the Membership FAQs below or click the Live Support link to speak with a Membership Specialists. Create a My USSA account and/or log into it. If you are already a member and need to register a new member, choose an option below. A My USSA account allows you to manage your membership(s) among several other benefits. To create a My USSA account click the "Create a My USSA account" button below to open a new window to create your My USSA account, which is absolutely FREE. If you have already created a My USSA account then log into it. If you have forgotten your My USSA username or password click here. Click the Renew Membership link. In the "My Account" box on your My USSA page click the link "Renew Membership". Or, if you need to renew a membership for someone else then first click their profile in the "Linked Members" section of the My Account box and then click the link "Renew Membership" for that member. You will be redirected to the online Membership application. Complete the online Membership application. The online Membership application will walk you through the necessary steps of renewing a membership. Once you have completed the online Membership application visit your My USSA page. In the "My Account" box click the "Member Card" link to download and print your membership card. 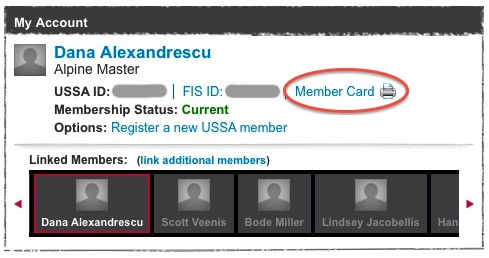 If you renewed a USSA membership for someone else then first click their profile in the "Linked Members" section of the "My Account" box and then click the "Member Card" link to download and print their membership card. For information on linking members to your My USSA account see the FAQ "Linking members to a My USSA account" or click the button "Link Member to My USSA Account" below to get started now. The USSA accepts Amex, Discover, Mastercard or Visa for online registrations. We also accept checks (persoanl or cashier), money orders, Amex, Discover, Mastercard or Visa for paper applications (FIS, Short-Term and club renewals). How quickly can I get a membership card? Athlete memberships are immediate through online registration. Once you have registered/renewed, you may download a membership card from your My USSA account. Manual applications/renewals may take up to several weeks depending on the time of season. NOTE: Coaches and officials who are pending for either background screening or completion of the Fast Start Coaching Course are not eligible to participate and will not be able to print a membership card the USSA receives a green light determination on background screening and/or the Fast Start Coaching Course has been completed. FIS stands for the Federation of International Skiing. It is an international registration required for some upper level competitions held in the U.S. and abroad. FIS ages and deadline may vary by sport. Please contact USSA Member Service for details at membership@ussa.org or 435.647.2666. How can I get a receipt for my membership? Members using the online registration system will be automatically emailed a receipt. If registering by mail, fax or email and you require a receipt, please note your request on the application or renewal form. Otherwise, you may contact Member Services by phone at 435.647.2666 or by email at membership@ussa.org to obtain a receipt. Can I sign up at an event on the day of the race? Some event organizers do let athletes register on site, but there is no guarantee. USSA recommends you sign up online to avoid problems and delays in activating your membership. On site registration is prohibited for coaches and officials. How long does it take to get a membership processed? Online registration for USSA athlete memberships is immediate. NOTE: Coach and official memberships may require successful completion of USSA's background screening and/or Fast Start Coaching Course prior to activation.Please allow several weeks for background screening (longer for foreign coaches). Screening times vary, so please register early. When does the late fee go into effect? Most renewals are due in our office or must be completed online no later than October 15. October 15 is also the deadline for Division/State late fees. Please get your paperwork in before then in order to avoid paying the late fee. After October 15 your membership will not be processed without all applicable late fees. See below for those membership categories that are exempt from the late fee. Does everyone pay the late fee? New members are exempt from late fees. The USSA late fee is applied to all renewing members, with the exception of those who hold only an official’s membership. If any other membership is held then the USSA late fee does apply. Please be advised that division and/or state organizations may charge a late fee in addition to the USSA late fee and may charge late fees to youth and official members. Can I renew/join over the phone? No, USSA cannot accept registrations by phone. USSA accepts applications through our online registration system. How do I know if I need a USSA membership? If you are participating in a USSA sanctioned event you must have a USSA membership. Automatically: When you create a My USSA account, if the last name, date of birth, and gender you enter are the same as a Member account on file then you will be asked if you want to link the two accounts together. Manually: You can manually link Member accounts by visiting the "Link Additional Members" page and following its instructions. Excess participant accident insurance during USSA sanctioned events*. Click here for details.